With remarkable equipment, technology and a superior team, Orbus Exhibit & Display Group® produces up to 26,000sq. ft. of display graphics per hour. Our quality control and full service customer satisfaction team includes talented print production crews, sewing and finishing teams, pre-flight art staff and more, all dedicated to producing the best quality display graphics. We are proud to be able to provide consistent, high quality graphics with accurate color to the G7 specification. With 15 state-of-the-art printers, we provide our clients with graphics to complement our line of Orbus hardware display products creating a one-stop shop for all of your trade show requirements. We specialize in trade show applications such as banner stand graphics and popup graphics, and can print on more than 23 materials. 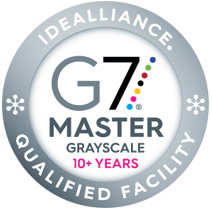 Orbus Exhibit & Display Group is proud to be G7 Master Certified. Our print capabilities, combined with our professional, experienced staff and unsurpassed client service provide you with an invaluable trade show graphics resource. Our artwork guidelines make it easy for anyone to submit original artwork. Upload files to our FTP site. Learn aout the quality checks made on submitted artwork. Orbus doubles graphic print capability. Learn more about Orbus' graphic capabilities.